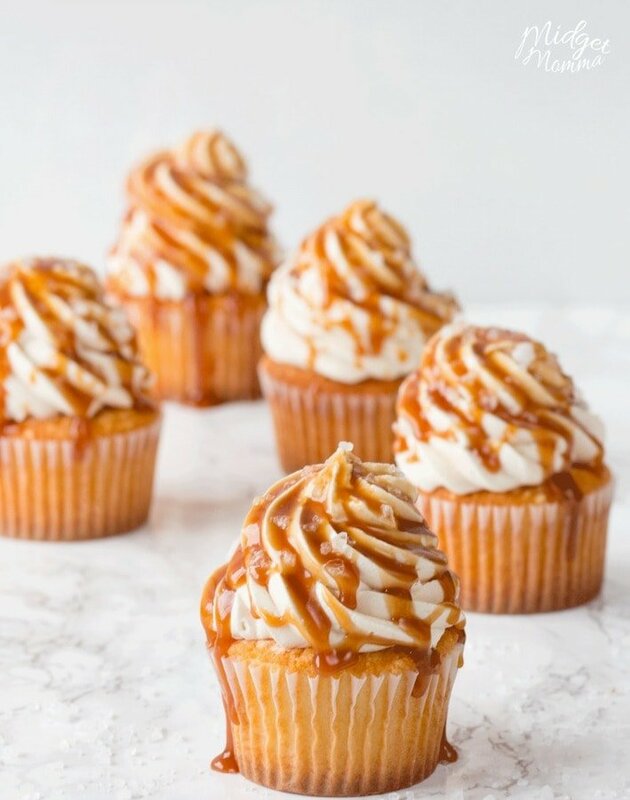 These Salted Caramel Cupcakes hit the spot whenever I want a sweet and salty treat that is AMAZING! I am a huge fan of salty sweet creations. 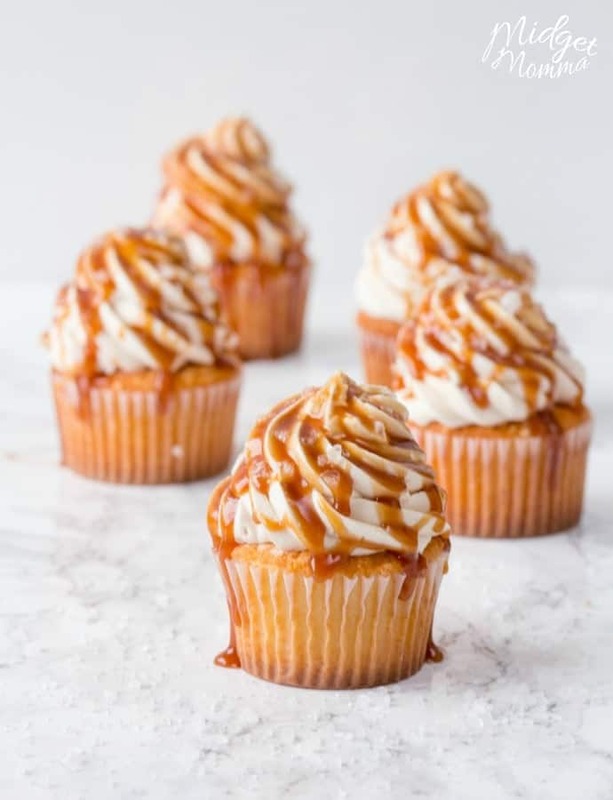 Anytime you combine salty and sweet, like with these Salted Caramel Cupcakes I am sure to be a fan! It is one of the secret keys to my heart. Ever since I watch an episode of Good Eats with Alton Brown where he took unexpected sweet treats and added salt to help bring out their flavors. It was fascinating to me and I just had to try it out. Before then I had never had a salted caramel or a chocolate covered pretzel before. Now those are my two of my favorite sweet treats. 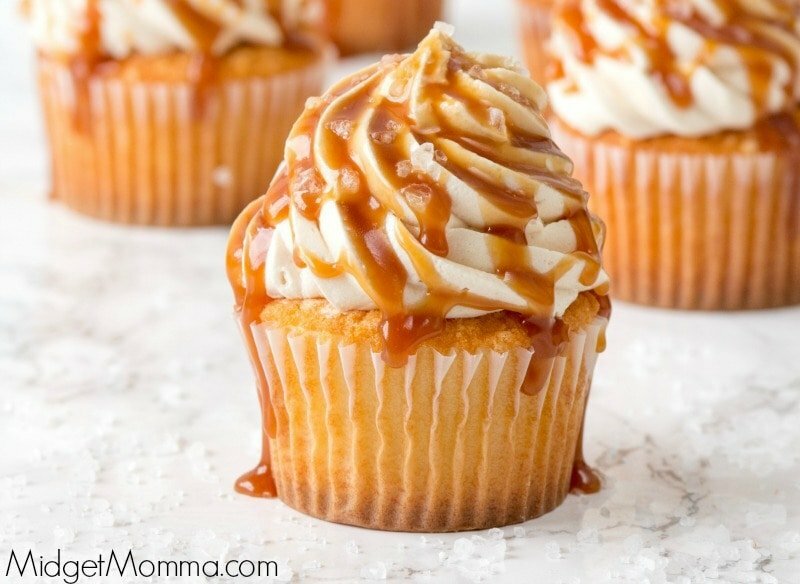 I figured that my caramel buttercream would make a great salted caramel cupcake frosting. The caramle frosting is the best caramel frosting ever. Seriously, I am not just saying this because it is a recipe created. I am saying it because anytime I make something with it, I hear that it is the best frosting recipe, while they are taking bites! 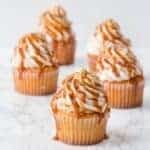 This caramel cupcake is very decadent with my homemade caramel sauce drizzled over the top. It can work for a family dinner dessert treat, or blow away your guests if you are having people over for dinner! 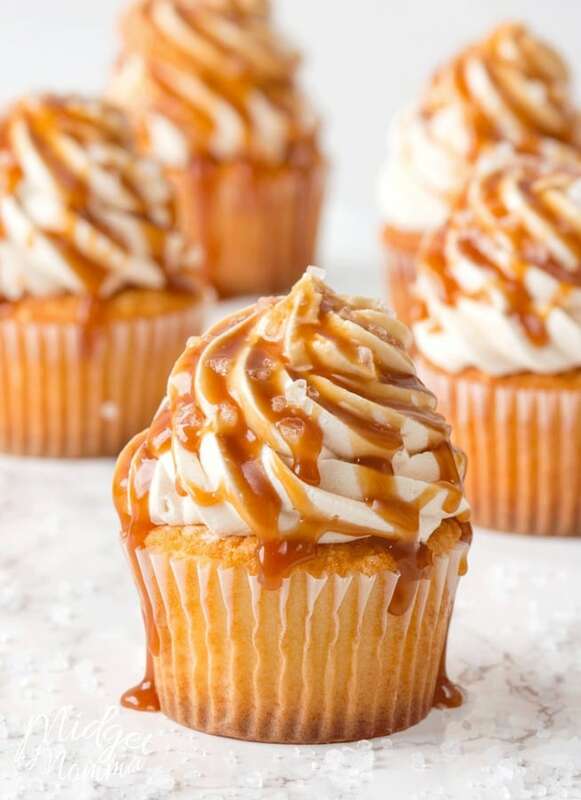 Now there are a few tips for making Salted Caramel Cupcakes that are important and will make your cupcakes the best cupcakes they can be! Do not use a classic table top salt for the top of your cupcake. If you were to sprinkle it on the cupcake they would start to dissolve I’ll soon as they got wet because the crystals are so small. It is a must to use a coarse sea salt or even kosher salt, check out here to pick up some great salt for your cupcakes. Skip the boxed cake mix! I know it is sometimes so easy to use a boxed cake mix, but they are not where near as amazing flavor wise as homemade. You can use chocolate cupcakes or this Bakery Style vanilla cupcake recipe, they are my go to cupcake recipes. They never have failed me, they have never given anyone a reason to tell me my dessert wasn’t top notch. When a recipe I come up with is loved by all, it is the one I stick with always. Make them BEAUTIFUL! 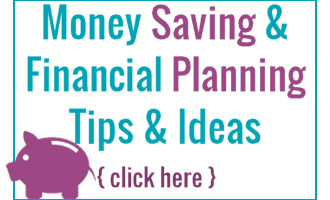 Which is SUPER easy to do! They look so much better with an amazing cupcake swirl, instead of spreading the frosting on the top of the cupcake. If you are worried about having a flop of a swirl because it is your first time making them, I can tell you that no one even notices unperfect cupcake swirls and nor will the care once they take a bite! If you have always wanted to make an icing swirl so you have pretty cupcakes, check out this step by step guide on how to make an icing swirl. It really changes the look of your cupcakes! If you are using different flavored frostings and want them both on top of your cupcake swirled together, check out how to swirl two icing flavors. If you want to layer your frosting flavors, check out the layered frosting swirl! Bake your cupcakes and let them cool.Place your piping tip into your pastry bag and then fill the bag with your caramel buttercream. 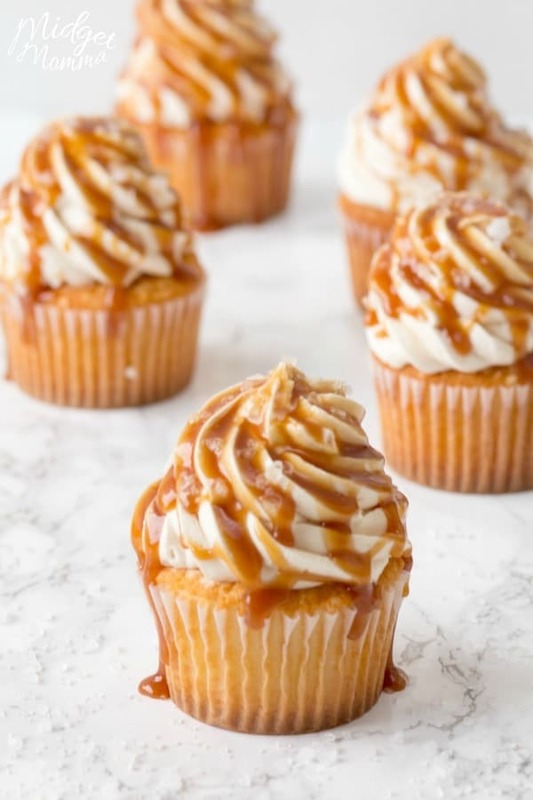 Swirl the buttercream onto each cupcake.Pour about 1/2 to 1 tablespoon of caramel sauce on the top of the buttercream letting it drip down the sides. Lightly sprinkle the salt on the tops of each cupcake, you can control how salted your caramel is.